Enjoyed on tap at the brewery after my tour. Awesome group of guys there and the beer was better than I had anticipated as I had only had their standard beers we get in Florida. This time I got to try the local release stuff. A: single finger head with scattered lacing on a bright golden clear body. S: lots of aroma with this one. Herbal, earthy and citrus as expected from the hop variety. T: very light on the malt. The citra hops and their candied fruit, citrus and candy sugar are in full force but the bitterness isnt overdone. M: medium body and moderate carbonation. Overall: I think citra provides some of the best all around degrees and quality of aroma and flavor. For a single hopped IPA, this one was good. 12 oz. bottle poured into a DFH Signature goblet. Label coded 234A13 = bottled on April 4, 2013. A - Pours a clear golden amber. About a finger of off-white head sits atop the bubbly body. Thick lace remains around the inside of the glass after each sip. S - Fragrant guava, kiwi, and an abundance of citrus. Grapefruit hops and a generous amount of sweet malts. Biscuits and honey along with some indistinguishable grain. T - Unsurprisingly, citrus dominates from the get-go. Twang of juicy grapefruit, along with apricot sweetness. Some biscuit malts and caramel balance the hop assault midpalate. Quite bitter on the back end with big hop linger. Big flavor in this huge IPA. M - Medium to thick in body with fitting carbonation. Goes down slick and easy for a 10%'er. O - I have really enjoyed this beer on tap over the last year and I've been awaiting the release in bottles. Citrus from the citra is the most obvious component, but there is a nice sharp bitterness on the back end. This is a single hop beer, but is not singularly hoppy. Very balanced for a beer showcasing the hops. 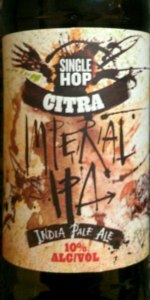 I highly recommend it if you like citra and live near MD. 12oz bottle poured into a Flying Dog goblet. The beer pours a fairly clear golden, copper color with a nice 2 fingers of cloudy, white head that has decent retention and leaves a nice web of soapy lace behind. The aroma is of sweet caramel malt, light citrus and fruity hops, a touch of pine but not much else, this is a massively malt forward nose that really hinders the citra hops. The flavors are very similar, lots of sweet malt, sugary alcohol, light citrus and fruit with a bit of floral character and a bit of pine. The body is thick, a bit chewy, with moderate to low carbonation that has a bit of a creamy finish that is hardly dry. Verdict: A bit of a miss from Flying Dog, heavily malt forward that really doesn't let the Citra hop shine. The sweet and almost cloying malt bill and alcohol is really unappealing and the lack of complexity, balance and pizzaz renders this to be a boring IPA.